On behalf of the dedicated men and women of the Antioch Police Department, please allow me to thank you for visiting our webpage. 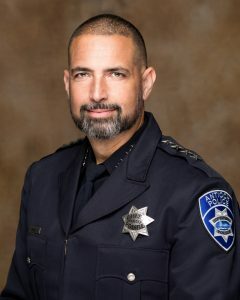 In addition to the information found on this website, I would also encourage you to check out our Facebook page (facebook.com/antiochpolice). There you can read about current events and learn about the more personal side of what goes on at the Antioch Police Department. The City of Antioch is a full service municipal agency serving a population of more than 114,000 residents. The police department is authorized a sworn staff of 104 officers and 33 non-sworn employees, which includes Dispatchers, Community Services Officers and Administrative Support staff. The department is comprised of two divisions: Support Services and Field Services. The Field Services Division includes Patrol, Community Engagement, and Traffic Bureaus. The Support Services Division consists of Administration, Dispatch, Investigations, Special Operations, and Records. Antioch is the only city in Contra Costa County with its own animal shelter and services, both of which also fall under the purview of the police department. Our police department is located in downtown Antioch, near the Marina, in a 67,000 square foot facility. It features an indoor firing range, weight training/exercise room, and community meeting room that also serves as the city’s primary Emergency Operations Center when necessary. Officers may work in a variety of assignments including Patrol, Traffic, Community Engagement Team, Investigations, SWAT, Hostage Negotiation, Field Training, and K-9. Assignments for our non-sworn staff varies as well, with assignments in Administration, Secured Records, Crime Analysis, Dispatch and Investigations. Community Services Officers can also be assigned to Evidence, Custody, Training, CSI, and the Front Counter. Most of Antioch’s training is conducted in-house. Officers with special expertise may apply for and become instructors. These officers provide training in the areas of first aid, defensive tactics, firearms, emergency vehicle operation, tactical communications, cultural awareness and much more. As we continue to grow and welcome new members, we proudly maintain a culture professionalism, dedication, inclusion and pride of each other and our community.